We tend to think of Boccherini primarily in terms of the many productive years he spent in Spain, and of the marvellous music he wrote there. But here is some gorgeous music written almost ten years before the move to Madrid, written when Boccherini was still a teenager. 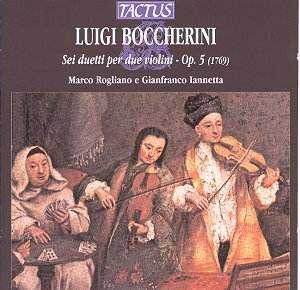 During the early years of the 1760s the young Boccherini was seeking musical employment in Vienna and in his native Lucca. He was already composing, and this set of duets was the product of these years of travel and aspiration. Later in the decade, Boccherini and the violinist Filippo Manfredi became something of a �hit� in Paris, notably after a public concert in 1768. The duets were published in Paris the following year, in part, no doubt, because of Boccherini�s new found popularity and fame. The repertoire for unaccompanied violin duet is not enormous, at least not if one discounts pieces written for amateurs and beginners. Even so, any list would include work by, for example, Stamitz, Haydn, Pleyel, Spohr, Moszkowski, Wieniawski, Bart�k, Prokofiev, Shostakovich. These six duets by the youthful Boccherini deserve a high place amongst such company. All six are in three movements. Except for the first and fourth duets, the format is a slow movement framed by two quicker ones. The first duet has the sequence grazioso-allegro-presto; the fourth that of moderato-largo-allegro. Ezra Pound, in his ABC of Reading (1951) observes that �Music rots when it gets too far from the dance. Poetry atrophies when it gets too far from music�. Boccherini�s music is never too far from the dance, never in danger of atrophying. It is worth remembering that Boccherini�s family connections included not only his double-bass playing father, but a sister, Maria Ester, who was a prima ballerina of European reputation. Only four of the movements in these duets carry the name of a dance � the second, third, fifth and sixth all end with a movement marked either tempo di menuetto or minuetto - but the rhythms of the dance, however hushed, are never very far away. This is true even of the slow and exquisite grazioso which opens the first duet and the cantabile adagios of the fifth and sixth. Listening to the faster movements is a positive invitation to dance! Boccherini creates fascinating passages of interplay between the two violins. For the most part the second violin is restricted to the role of accompaniment � though never without striking touches and unexpected details � but at other times, as in the last movement of the second duet, there is more sense of a dialogue of equals. Marco Rogliano (who, I presume, plays first violin) and Gianfranco Iannetta are very persuasive advocates for this music. They play with sensitivity, secure tone and intelligence of phrasing. This is wonderfully intimate music, ideal for home listening, given its smallness of scale on the one hand and its substantial musical content on the other.